On Martin L. King, Jr. Sunday (January 15) Cantus, a male vocal ensemble, sang ‘America Will Be!” as the Offertory Anthem at Minneapolis’ Westminster Presbyterian Church. The text of the anthem was Langston Hughes’ powerful poem, “Let America Be America Again” with music by Paul J. Ridoi, composer and a tenor vocalist with Cantus. Afterwards I discovered the actual title of the poem, retrieved and read and re-read the words of the poem and conducted Internet research about the poem and Hughes and after reflection came to powerful conclusions about the poem. First, Hughes (1902-1967), an African-American, was a poet, novelist and author and an important participant in the Harlem Renaissance in the 1920s. He flirted with communism, but never became a member of the Party, and as a result in the 1950’s was subpoenaed by a Senate committee led by Joseph McCarthy, which was portrayed in a play at Minneapolis’ Guthrie Theater. Second, the poem was written in 1935 in the midst of The Great Depression and originally published in the July 1936 issue of Esquire Magazine. As another commentator said, the poem speaks of the American dream that never existed for blacks and lower-class Americans and the freedom and equality that they and every immigrant hoped for but never achieved. The poem besides criticizing their unfair life in America conveys a sense of hope or call to action to make the American Dream soon come. Fourth, the poem’s first three stanzas (minus the first three parenthetical statements) open with a common statement of the American Dream. But it soon becomes apparent the poet speaks for those who are left out of that Dream. I especially invite comments from those who have studied Hughes’ life and works more extensively than I have. The bulletin for the service and a video recording of the service are online. 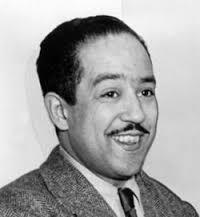 Langston Hughes Biography; Langston Hughes, Wikipedia; U.S. Senator Joseph McCarthy Encounters Langston Hughes at Minneapolis’ Guthrie Theater, dwkcommentaries.com (May 13, 2012). Poem, Let America Be America Again, PoemHunter.com; Let America be America Again, Wikipedia. The title of this poem was used in a 2004 presidential campaign song by John Kerry, then a U.S. Senator. I will resist the temptation to wonder whether Donald Trump’s incessant campaign slogan “Make America Great Again” was drawn from this poem. I doubt it, and Hughes, I am confident, would be appalled at any such use of his words.